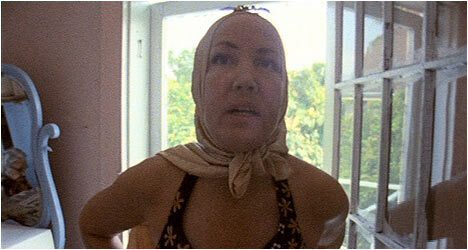 Grey Gardens (1976) is an odd curio even by the Criterion Collections’ standards – a documentary about Jackie Kennedy’s aunt Edith Bouvier Beale and her daughter Edie who lived in a run-down, 28-room house on Long Island. How did these two members of one of the richest, most powerful families in America live in such squalor? Albert and David Maysles’ film examines the idiosyncratic relationship between mother and daughter or, Big and Little Edie as they are affectionately known. There is an oddly fascinating juxtaposition between the elegant way they speak, like something out of an F. Scott Fitzgerald novel, and the poor conditions they live in. It is kind of tragic in a pathetic way as the two women try to cling to the elegance of the past (all the while bickering with each other as only family members who have lived with each other too long can) when their present is so depressing, but they soldier on because they don’t know any other way to live. At one point, Big Edie pours over old photographs of herself when she was young and beautiful and life was good. She had been a singer and was married to a rich man. They listen to old records and she sings along to them. There is a powerful moment when they are listening to a religious sermon on the radio and the camera stays on Big Edie’s face, capturing the sadness in her eyes as the preacher rants about staying on top in life – something that she clearly did not do in her own life – and in the next cut, she has composed herself and cheers on the preacher’s words with her daughter, but we have already seen her moment of vulnerability. It has been captured on film forever. Big Edie is clearly in the twilight of her life when the documentary was filmed, but Little Edie was only in her 50s so what happened to her and why is she still living with her mother? Little Edie was also gorgeous in her youth. She could have easily been a model, but wanted to be an author. She could have married rich men, but had no interest in the institution of marriage even after all her friends took the plunge. Or maybe she just didn’t find the right man. This is left up to the viewer to ponder. And yet, these two women come across as fiercely independent in the sense that they are so far removed from mainstream society that they seem to exist in their own unique, hermetically sealed off world. The Maysles capture this all with their unflinchingly honest cameras. To celebrate the film’s 30th anniversary and capitalize on its cult following (big enough to spawn a hit Broadway musical and an HBO movie starring Jessica Lange and Drew Barrymore no less), the Maysles decided to go through all of their excised footage from their original documentary and put together another one, entitled The Beales of Grey Gardens (2006). This time out, they capture a decidedly more conversational, even whimsical vibe as evident from the opening scene where Little Edie happily sings, “You Ought to Be in Pictures” while doing a little dance. For fans of Grey Gardens this is even more of the same with the irrepressible duo doing what they do best – being themselves. Michael Musto’s essay cheekily observes that this was “the world’s first superbly twisted reality show,” and he’s got a point. But unlike the current glut of grotesques and how they are depicted, you never feel like Big and Little Edie are being exploited. Grey Gardens and The Beales of Grey Gardens are not movies that I feel particularly moved to watch again, but I do feel like I’ve seen something unique and experienced something special. The Criterion Blu-Ray improves significantly from the DVD incarnation with richer textures and colors. It is amazing that the films look so good considering the low-tech way in which they were shot. On the Grey Gardens disc there is an audio commentary by filmmakers Albert Maysles, Ellen Hovde, Muffie Meyer and Susan Froemke. This is expertly edited in order to avoid the chaos that sometimes happens with multiple commentators. They all talk about the unique approach they took to the doc and why. They saw this film as a tribute to the courage of these two women. They are all able to articulate, through analysis, the themes of their doc while also providing insight into their subjects much like anthropologists. “Little Edie” features audio excerpts from an interview she did with Kathryn G. Graham for Interview magazine in April 1976. She talks, among other things, about her stint in boarding school and what it is like living with Big Edie. She also speaks about the Maysles and how they disrupted their daily routine and what she thinks about their work. There are “Interviews” with fashion designers Todd Oldham and John Bartlett who talk about the influence of the film on them and their work. Oldham finds the doc visually beautiful and “one of the most hypnotic glimpses into a very bizarre human psyche.” He is clearly a die-hard fan of the film and knows all the dialogue. Bartlett talks about its cult status in the 1980s. Like Oldham, he speaks about Little Edie’s unique fashion sense and how it influenced not only his work but others in the business. “Scrapbook” features a collection of old family Beale photographs and newspaper clippings, behind-the-scenes still from the doc and pictures of the many cats that inhabited Grey Gardens (?!). Also included are a theatrical trailer and a T.V. spot. On The Beales of Grey Gardens disc is an introduction by Albert Maysles who talks about what motivated them to revisit Big and Little Edie and his impressions of the two women.